I have never been more excited for Thanksgiving you guys. ALL my Sisters are going to be home in Milwaukee which hasn’t happened over Thanksgiving for about 8 years. Also, my new Fiancé is coming with me! Not only does he get to experience a holiday with my amazing and huge family, but we get to finally celebrate our engagement with everyone and talk about wedding plans. I’m hoping to return to NYC with a date set and a venue picked! Cross your fingers that one of my top choices pans out. In addition to all the exciting wedding planning/family things, I am bracing myself for the feast of a lifetime. You see, my Mama has always mainly cooked Thanksgiving dinner and it’s always been great, but this year we’re combining forces with my sister Nadia who is a wonderful cook and Me, who has lots of fun dessert ideas. I think it’s going to insanely good. Also the Packers are playing on Thanksgiving which just makes it that much better. Last year at Christmas, around the time I was pondering the idea of maybe starting a baking blog, I made a version of this cheesecake with my Mom. She normally makes just pies for our desserts, but I wanted to try something different. I knew I could rely on Martha Stewart to supply me with a great recipe for my first ever cheesecake and she didn’t disappoint. Everyone adored this silky-cheesecake and we decided it should be a Holiday dessert staple from now on. If you’re looking for an extra dessert for your Thanksgiving spread this is the one. It packs all the delicious spices and flavors of pumpkin pie, but adds a crisp gingersnap crust and the bruleéd top which makes it even more amazing. If you don’t have a kitchen torch you can easily skip that step, but I think that crispy burnt sugar top adds such a nice touch. (We actually had a bruleéd pumpkin cheesecake at dinner on the night we got engaged so maybe that’s why I like it so much!) Stay tuned the next few days as I am planning to post a round up of a bunch of amazing pumpkin recipes! Have a great weekend! Make the crust: In a medium bowl, mix gingersnap crumbs, sugar, and butter until moistened; press firmly into bottom of pan. Bake until golden around edges, 10 to 12 minutes. Place springform pan on a rimmed baking sheet. Pour filling into springform, and gently smooth top. Transfer to oven; reduce oven heat to 300 degrees. Bake 45 minutes. Turn off oven; let cheesecake stay in oven 2 hours more (without opening). Remove from oven; cool completely. Cover with plastic wrap; refrigerate until firm, at least 4 hours. Unmold before serving and if you want the bruleéd top- sprinkle generously with sugar and then melt it with the kitchen torch until sugar is caramelized, brown and bubbly. The bruleed top is an awesome idea! I can imagine that getting this mix of textures all in one bite would be fantastic, not to mention the great flavors here. Yum! Teaming up in the kitchen always makes for a fun time and more than one talented baker/cook is a sure fire recipe for a memorable meal. 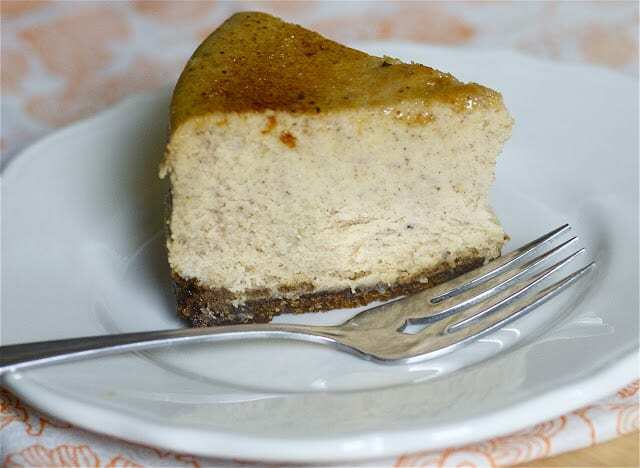 Oh man – bruleed cheesecake? I think I’d die and go to heaven in an instant. Sounds amazing! This looks heavenly! I am making a pumpkin cheesecake for Thanksgiving so this is perfect timing! Hope you have a wonderful time with your family! Wow, looks great. We love any kind of cheesecake, now to get me one of those little torches…. Mmmm, this looks amazing! Wow! Have a great Thanksgiving with your family..
Do you think it would be possible to put the sugar topped cheesecake under the broiler for as few minutes (watching carefully) to caramelize the sugar? @Sue- the few times I’ve tried to bruleé anything with the broiler it has burned terribly. However, the broiler on my oven runs hot so that could be why. Everything about this screams Thxgiving and I love it! The gingersnap crust throws it over the edge. Lovely. Good luck with the wedding planning! And good greif that is one amazing cheesecake! These cheesecake looks delicious, I love pumpkin but I also have a new obsession with gingersnap crusts! 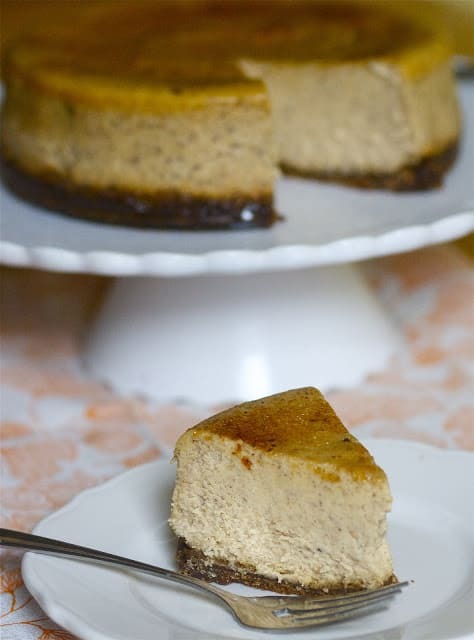 I love cheesecakes made with a gingersnap crust and I bet it works perfectly with the pumpkin! ooooh this sounds perfect! 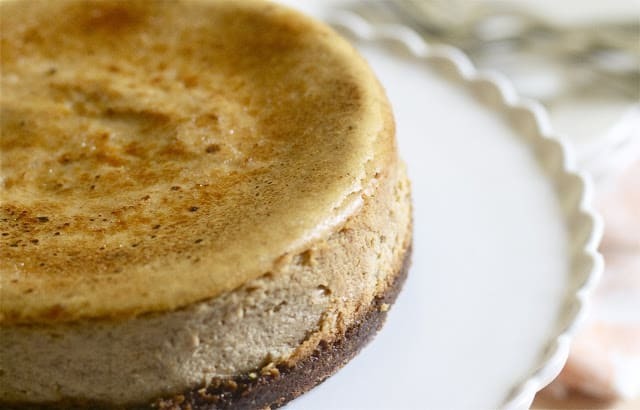 i wanted to make a pumpkin cheesecake with gingersnap crust this year but never got around to it. i’ll just come eat a slice of yours ;) ps* totally love the idea of the bruleed top! This cheesecake looks dreamy and I love the crust! Good luck with the beginnings of your wedding planning! This looks awesome! I love pumpkin cheesecake, it’s divine, I just haven’t found the perfect recipe yet so I think I’m going to try this one out! This is a stunning cheesecake! You’re going to have a terrific time….Sisters ROCK! My sister arrives on Sunday and the other one lives about an hour away. We’ll be together ALL winter! WooHoo! OMG…MY QUEST FOR THE PERFECT FINALE TO OUR THANKSGIVING FEAST HAS OFFICIALLY ENDED…I am personally giving “thanks” to you for such a showstopper/crowd-pleasing marvel of culinary creativity and prowess. Not wishing to toy with your perfection, do you imagine it would be possible to substitute Belgian Speculoos for the gingersnaps in the crust?..much easier to find here in France! Thank you for taking time out from your hectic wedding preparations and complete sister reunion/Thanksgiving to provide us with inspiration. Kudos. @Donna- Thanks so much! You made my day!! And yes- Speculoos would make an outstanding crust! Wow, what a great idea! Love that crunch on the top! Looks delicious.